Last Updated: February 23, 2019 By Katie 4 Comments -- Paid Promotion. Disclosure policy here. 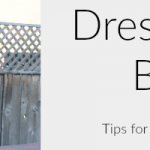 Lately, I’ve been LOVING the selection of clothing from, go figure, Amazon! And since Prime is life (getting things I order in 2 days shipped free to my door? YES PLEASE why can’t every store get on board with this?! ), I figured it was time to order some goodies and share my faves here with you! So that’s just what I did. And, guys. I have found some GEMS lately! 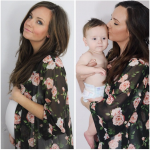 So today I’m sharing those gems- a few favorite goodies I’ve picked up recently from Amazon. And they are all SO GOOD. First off, I’ve shared them before, but of course I have to share them again, and I will continue sharing them until forever: THESE LEGGINGS. 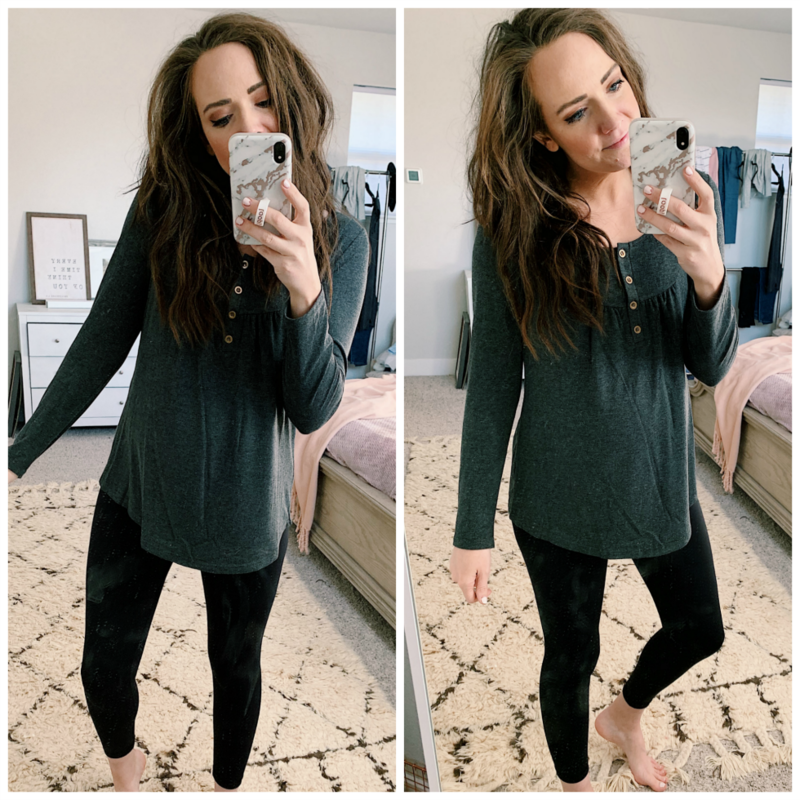 They are the best Lululemon dupes I’ve tried (although I did also order this pair which I’ve heard are good, too, and will report back once they arrive! ), they are NOT see-through, are soft like butter, smooth, hold everything in, make the booty look fantastic, AND they fit with a bump, without being restricting! 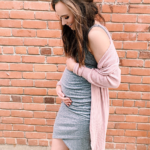 I got my normal size small, and just ordered up a size to a medium for my 3rd trimester! 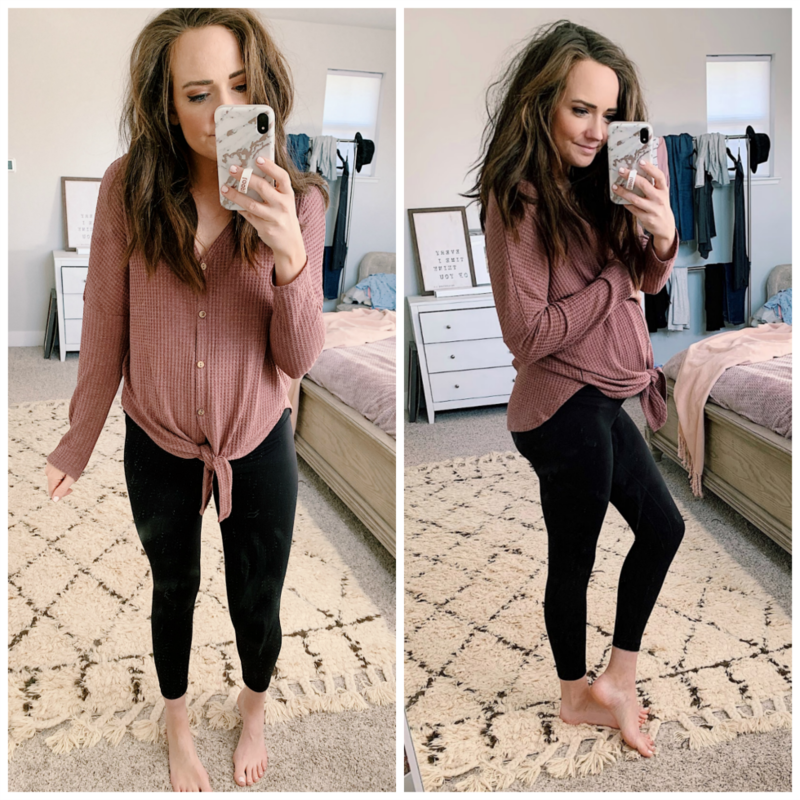 HIGHLY recommend these leggings! BUTTON DOWN THERMAL. Another dupe, this time for this famous Urban Outfitters top that is very similar! I own the Urban one too (here! and on sale for $34! ), and will say that I do like it a smidge better because it is much softer (seriously SO SOFT I could live in it!) but for the price, this one is an excellent choice! It fits great, is also comfortable (just not AS comfortable, but nothing is lol), and my favorite part is the color of this one (I got the rust red)! The mauve is just gorgeous! It will be perfect for nursing, too! I sized up to a medium (I’m normally a small) and am so glad I did. Even without a bump, I would have sized up, because it’s the perfect length. Great for leggings, as it covers the bum! HENLEY TOP. Okay, how cute is this basic little henley top?! I love the buttons (fully functional) and it sits so well. Again, perfect leggings length! I sized up to a medium in this one, too, and recommend it! CUTEST KID’S JAMMIES. Annnnnd last but not least, duh I had to add something for the little ones! 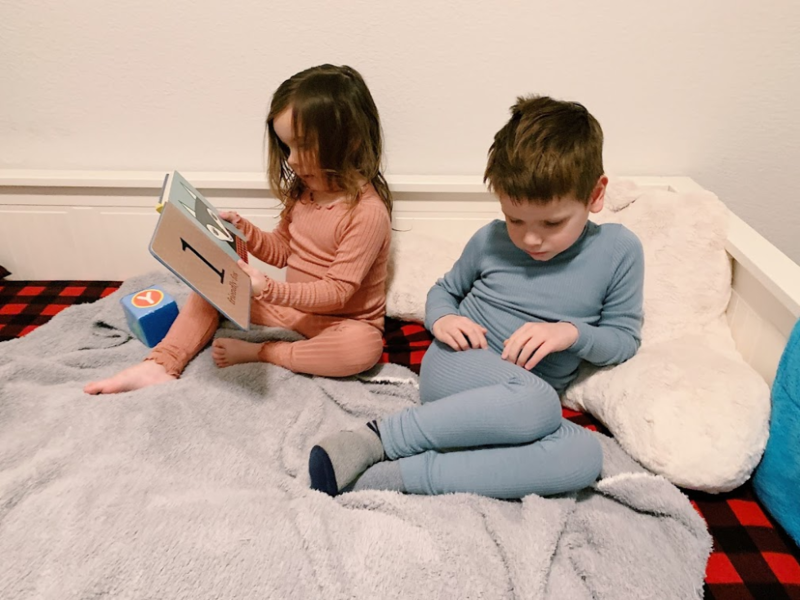 HOW cute are these jammies?! Not only are they adorable, they are super soft (seriously you have to feel them, SO SOFT), stretchy and the ruffles on the girl ones are to die for. I love the colors they come in too. I sized up for both kids, because I like to get my money’s worth, and it works since they’re so stretchy! I got Sophie (3) a Large (4T/5T) and Sam (almost 5) a XL (6T/7T). 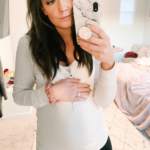 HALFWAY THERE WITH BABY #3! Aw thanks girl- you’re so sweet! :) Unfortunately, looks like the top is sold out and is only available in the tank version. Hoping for a restock of the long sleeve ones! I’ll share if I see they come back!